Billy Joe Saunders will defend his WBO middleweight title against former world champion David Lemieux on 16 December. 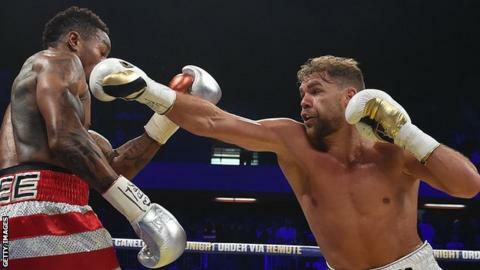 The fight, set to be staged in Montreal, Canada, will be Saunders' first professional bout overseas. Lemieux, 28, has 38 wins from 41 fights and held the IBF middleweight crown in 2015 but lost it to Gennady Golovkin. "Once I beat Lemieux I'll move onto bigger fish; the winner of the rematch between Saul Alvarez and Golovkin," said Saunders, 28. Saunders, who is unbeaten in 25 fights, holds the WBO world title at 160lbs, while Golovkin holds the WBC, WBA and IBF belts. Alvarez's promoter Oscar de La Hoya had said Lemieux would have been his choice of opponent if a rematch with Golovkin could not be finalised. Montreal-born Lemieux is regarded as a power puncher - with 33 knockouts from his 38 wins - but has been recovering from a shoulder injury following his latest win in May. "It's time to be world champion again," Lemieux said. "Saunders is about to get destroyed."